Bluehost Vs JustHost Review: Which Is Better Host for WordPress? 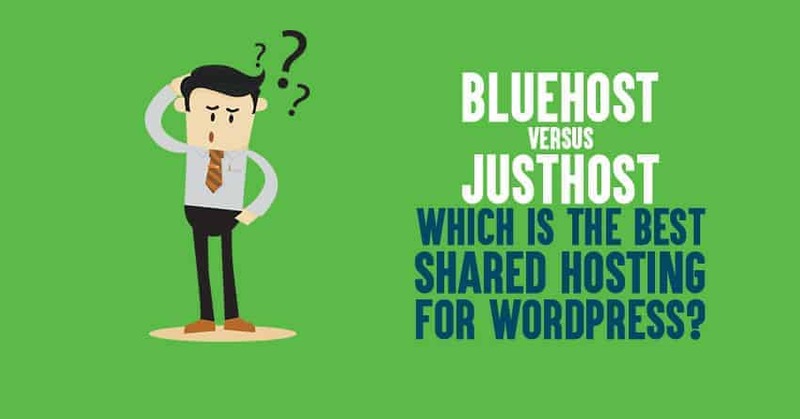 Home » Hosting Comparisons » Bluehost Vs JustHost: Which is the Best Shared Hosting for WordPress? Are you looking for a honest Bluehost Vs JustHost comparison? You just have landed in the right place where I’m going to talk about a detailed comparison between the two great web hosting services Bluehost Vs Just Host. First things first. How can you decide if a web hosting service is any good? It’s really hard to pick the right web hosting for WordPress sites especially if you are a beginner who knows nothing about the best shared hosting for WordPress. I’ve been blogging for years now and I know the best hosting that suits your needs especially if you are on budget. So in this Bluehost Vs Just Host comparison post, I’ll help you what both of them offer and you can decide which one to prefer among them. 1 Bluehost Vs JustHost comparison: which is best? Bluehost Vs JustHost comparison: which is best? Bluehost web hosting company was started in 1996, it is considered as one of the biggest web hosting companies in the Internet world. They are known for providing the reliable web hosting services at the most affordable prices for WordPress users. Bluehost shared web hosting offers you the following benefits. The quality of any web hosting service depends majorly upon how they treat their customers. Bluehost has the most experienced customer friendly support staff who can help you to resolve your hosting related issues. They also have a huge knowledge database that already has answers for majority of the questions that newbies might have. If you don’t find solutions in their database, you can either do a live chat with them, create a ticket or even call to their toll free numbers. Your email accounts, files, domains, logs, services etc all these are extremely important to run your websites smoothly. If in any case, they are lost or damaged or hacked, you will have nothing to do but cry. It’s essential for you to take regular backup of your sites and it’s even better if you take full backup of your sites including databases. So even when your site gets hacked or if you accidentally lose all your website data (blog posts, pages, images or videos), you can still access them with your backup content. Beginners don’t care about taking backups of their sites. Even I did the same mistake when I launched my first professional blog and when I lost the data, I realized how important it is regularly backup my sites. With Bluehost, you are fortunate that it takes automated regular backups of your sites so you don’t have to worry about losing your data. Your files and databases are safe with Bluehost. They charge a nominal amount of $1 per month to avail their automated backups of your sites feature. It’s extremely important and I highly recommend all the WordPress users who want to go with Bluehost to make use of it. How can I speed up my website is the most important questions asked by majority of the WordPress users. If you are a beginner, you should know the fact that Google gives top priority to your sites if they load faster and take less than 3 to 4 seconds. If your sites take more than that, your site might get penalized for slow loading times issue. Did you know that your web hosting highly impacts your overall website loading speed? It’s true that your web hosting service is the reason why your site loads fast or slow. Bluehost uses blazing fast servers to serve their users better. That way, your sites run really faster if they are hosted on Bluehost. The best part is, you don’t have to pay a lot of money to make your site faster. Did you know that Bluehost is trusted and used by over 2 million bloggers and marketers worldwide? Bluehost is known for providing the most reliable hosting options to its users and they are one of the industry leaders in web hosting. If millions of domains are hosted for over a decade, you should trust them. If you go and check out the Bluehost reviews, you will find most of the people saying nice things about it. So if you are not aware of Bluehost yet, you should definitely consider trying it. Bluehost offers 3 pricing options for their shared WordPress web hosting users. Basic: This is the basic package where you can get it just for $3.49 per month and you can host 1 domain on it. This is recommended if you are a beginner with low budget. Plus: This is the medium package where you can host 10 websites for just $5.95 per month. This is recommended if you are willing to pay a few more extra bucks to host up to 10 number of sites you own. Business Pro: This is the most advanced package where you can host unlimited number of websites you own that costs you $13.95 per month. Although there are not too many cons with Bluehost shared hosting but I find the following two as drawbacks of Bluehost. What if I’m not satisfied with Bluehost? Bluehost offers anytime money back guarantee. Meaning that, you get your money back any time if you are not satisfied with them. Now, let us talk about JustHost web hosting and see what they has to offer you to fulfill your WordPress hosting needs. Just Host formerly known as Super Green Hosting which is currently hosting more than 400,000 domains worldwide. It’s one of the reliable hosting services for WordPress users who are looking for cheap hosting options. Just Host features include the following. Just Host Pro shared hosting package allows you host any number of websites on the same host. That means even if you want to launch 10 more blogs or websites, you can host all of them on the same account without having to pay extra. The best part is, even if you are getting massive traffic to all those sites, you still won’t face any downtime issues. Facing issues with your hosting service is one of the most common things especially if you are a beginner, you will face a lot of problems related to setting up emails, transferring your domains, taking backups of your sites etc. With JustHost customer friendly support, you will get immediate help to resolve your hosting related issues. They are currently offering customer support in 3 forms which are phone, chat and email. Did you know that JustHost’s data center is equipped with a powerful UPS power backup generator and they perform 24/7 network monitoring to make sure your website servers are working all the time? Just Host has an outstanding server uptime that lets your visitors access your site any time from anywhere. Domain management: Managing your own domains is a lot of hard work. If you are parking your domains on different servers or hosting services, it’s a lot of work to maintain all of them. Having a cPanel on your hosting service is the easiest way to maintain your domains all at one place and run them smoothly. Email accounts setup and access: Managing your email accounts is hard as I already said in the same Bluehost Vs Just Host comparison above. If your web hosting service have cPanel, then it’s very easy to manage all your email accounts at one place. Website stats: If you want to see your live website traffic or monthly blog visitors, you can do so by logging into your cPanel account. You can have access to your website stats including the load on your databases. JustHost control panel (cPanel) provides all of the above so you can find it very easy to manage your emails and website information just by logging into it. When you sign up for Just Host it gives you access to UNLIMITED disk space, UNLIMITED transfers, UNLIMITED email accounts and the ability to host UNLIMITED domains at the cheapest price starting at $2.95 per month. Read more about the various pricing options offered Just Host below. Do they have any pricing plans and various options just like Bluehost? Yes, Just Host also offers 3 pricing packages namely Basic, Plus and Pro. Here are the details for all of them. Basic: This is absolutely suited for beginners who want to host just 1 site. You can get it for just $2.95 per month which is cheaper when compared to Bluehost hosting. Plus: You can host up to 10 sites that you own with this package that comes at $4.95 per month which is again cheaper when compared with Bluehost Plus package. Pro: With Just Host Pro package you can host any number of websites you own just by paying $9.95 per month which is a lot cheaper when compared to Bleuhost Business Pro package. What if I’m not satisfied with JustHost? JustHost gives you 30 day money back guarantee. It means, if you are not happy with JustHost features or hosting service, you can email or contact their support team to refund your money. Note: This Bluehost Vs Just Host comparison post contained some affiliate links which means I will earn a small commission when you purchase any of the hosting using those links. It won’t cost you anything more. Both Bluehost and JusHost focuses on giving top priority to their users by providing great customer support and affordable pricing packages. When you compare pricing, JustHost wins clearly over Bluehost. In all other aspects of web hosting, both Bluehost and JustHost offers almost the same features including a free domain name, offering 3 pricing options, providing better security etc. If you want to host your WordPress sites on a reliable, super fast and automated backups hosting service, go with the Bluehost. Although it’s slightly overpriced when compared to JustHost but it’s worth the deal! If you are looking for a cheaper WordPress hosting plans but still want a safer, great customer friendly staff and a great uptime guarantee (99.9% uptime guarantee), go with the JustHost.